Dogs and people really do want the same thing: They want to get along and spend time together. Unfortunately, no one can enjoy an ill-mannered dog, which leads to a vicious cycle: left at home or corralled into a kitchen, this dog learns nothing about the world and how to behave. When finally invited into the family circle, the dog is simply bursting with excitement but has never been adequately educated to know what to do. So his hyperactivity becomes annoying to his human family, resulting in further isolation but no further learning. To survive as a good human companion, a dog must learn what to do in his life. He must not only learn how to respond to formal commands, such as “Sit,” but he must learn to interpret and appropriately respond to human signals and frequently occurring situations. Given the opportunity, a dog will spend his entire life learning, and we must recognize that we’re consciously or unconsciously teaching him all of the time. Understanding how your dog learns allows you to shape his behavior to make him a better and happier companion. If you want a well-trained and civilized dog, you, and everyone who lives with you, should be consistent in your behaviors involving your dog. The first thing that you should do is to always use a word or phrase to signal what you want your dog to do. If you’re going upstairs with him, say, “Upstairs.” If you’re going to put a leash on him, say, “Leash on.” If your words always signal actions, the dog soon learns to pay attention to the sounds coming from your mouth because they signal what he’s supposed to do next. Always use the words before you act so that the dog can learn the meaning of your language. Everyone in your family must use the same words. If the aim is to get the dog off the sofa, make sure that everyone knows that you’re all going to use the word “Off.” If one person yells “Get away” and another “No!”, this inconsistency only confuses matters. Whether you’re starting your journey with a young pup or an older dog doesn’t matter as much as maintaining a consistent approach. Dogs respond very well to routines and repetition. Consider your morning ritual: rising out of bed, taking a shower, eating breakfast, letting the dog out, drinking coffee. When was your routine set? Probably in childhood. Whatever the sequence, you repeat the routine, quite unconsciously, day after day. Shaping your dog’s behavior is no different. Dogs actually love routines even more than you do: The more regular their schedule and the greater your predictability, the greater their feelings of safety and security and the more likely they are to behave in a cooperative fashion. Begin by establishing routines around your dog’s basic needs: eating, drinking, resting, playing, and eliminating. Assign a word and a specific routine for each need, creating a chart to help your household follow through (see Table 11-1). Though your dog’s schedule will vary slightly throughout maturity, the constancy of these words and routines will tie him to the certainties of his everyday life and give you a mutual language base. Remember, your dog doesn’t speak English (see Communicating with Your Dog). Though she listens to you, most of what you say sounds like gibberish. When a word pops in that she recognizes, it’s as exciting to her as our hearing recognizable words when in a foreign land. Though you need to take time out of your day to teach your dog the proper responses to your directions (for example, Sit-Stay), once she’s learned those responses, you can use the directions throughout the day. Practicing these exercises with your dog is like your being taught in school the skills you need for everyday life: Counting fruit or balancing your checkbook can be thought of as learning to stay or behaving appropriately when greeting someone or on an outing. Also, make sure that everyone understands that your dog loves attention. He’ll repeat anything that guarantees interaction and, like a human child, he can’t distinguish negative from positive. If a response guarantees anyone’s reaction, it will be repeated: If you put his food dish down when he sits calmly, then he’ll sit calmly. If you ignore hyperactivity and only interact with your dog when he’s rational and responsive, then your dog will learn to behave rationally. Of course, the reverse is also true: If a dog’s demanding posture is responded to, he’ll learn those undesirable behaviors just as quickly. Inconsistency will create confusion in your dog’s mind and often intensifies her reactivity. All the people in your dog’s life should know the rules and words to use around your dog. Imagine trying to understand what to do based on the reactions that you get to your behavior. Imagine trying to work out the rules if one person insists on consistency while another welcomes chaos. Under such circumstances you or your dog won’t be able to determine how best to behave when meeting someone new. In dogs, such inconsistency for different people in their lives invariably snowballs into maniac anxiety, and the resulting confusion guarantees only one thing: that your dog will not be welcomed into polite society or be the star attraction at family gatherings as he’d loved to be. In a perfect world, you’d be able to control everyone, consistency would reign, and your dog would never be confused. Alas, it’s no perfect world out there and, try as you might, some people just won’t heed your advice. If it’s an occasional stranger on the street, don’t worry about it, but if it’s a live-in companion that interacts frequently with your pup, then you must come up with a plan. If your companion encourages jumping, exercise your dog prior to his or her interaction with your pet to tone things down a bit. If he urges your dog to jump on the furniture, agree upon one piece of furniture and teach your dog that the others are off-limits. If feeding from the table is the main issue, be sure to feed your dog first and reward her for staying on her bed during meals. Be creative and think outside of the box: You’ll find there’s always another way around your problems with both four-footed and two-footed dogs. It’s hard for some people to see the downside to ecstatic joy. When asked, they’ll tell you that the wild greeting they get from their dog at the door is one of the highlights of their day. Unfortunately, permitting and, in effect, rewarding hyperactivity takes its toll: A dog who manically greets his own people will greet everyone that way. Furthermore, if the dog suffers from separation anxiety, even the sound of someone nearing the door is likely to trigger hyperactive anticipation, which, when unfulfilled, may result in destructive behavior. Substitute a response by refocusing your dog’s attention on another object, such as a treat cup or clicker. In the case of doorway excitement, teach your dog to sit when you shake a cup filled with treats and then practice at the door, shaking the cup as you open, shut, and knock on the door yourself. When your dog is fully conditioned to the sound, ask visitors to shake the cup, rewarding your dog for sitting quietly. Teach your dog a greeting trick, such as paw, belly up, or roll over. Everyone can teach these cheerful interactions, and they’re a wonderful way to break the ice and initiate positive interaction from the get-go. Become a treat hero. If your dog or puppy enjoys treats or (even better) food, place a handful in a cup and let your child dole them out when the dog responds to simple commands like “Sit” or “Come.” Work through the directions in Happy Training, Happy Tails, transferring the directional skills to your entire family. Phase off using the treat cup after a week of cooperative responses. At this time, shake the cup only half the time as you position and praise your dog’s cooperation. Although you’ll gradually reduce the number of treats, remember that praise and petting should be continued as a reward. Encourage more than you discourage. Kids (like dogs) are very sensitive to language and tone. When you discourage their behavior, you are, in essence, throwing a wet blanket on their relationship with your dog. Be creative, teaching them appropriate games to play and using treats to shape more positive interactions. Focus on what your children are doing right with their dog. If you have to step in to control the interaction, immediately help them find a more positive activity so that you can end on a high note. Create activity charts. Kids are so easy to please: Sometimes just an activity chart with stickers for getting the dog to respond to simple commands or perform simple tricks can be enough to prompt their eager participation. If you’re unsure how best to motivate your children to cooperate, ask their teachers for suggestions. Catch the team spirit. Kids (like dogs) love to be a part of a project! Try dispersing the responsibilities of caring for your dog so that not all the tasks rest on one person’s shoulders. You will have to help out one way or another, but when encouraged to help, children feel needed and empowered. 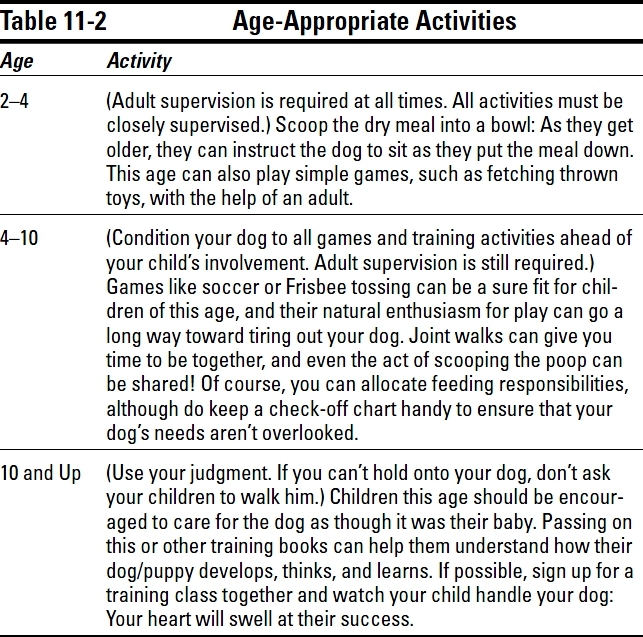 Table 11-2 outlines some age-appropriate activities. Don’t involve your children if your dog has shown any signs of aggression. Dogs naturally dominate young children: Asking them to care for an aggressive dog is putting them in grave danger. Get professional help. Creatively contain your dog. Create play stations for your dog (see Communicating with Your Dog) in each room, securing him when he’s unable to contain himself. When you can supervise the interaction, ask your children to race about, thereby teaching your dog how to displace her urge to chase by offering her a favorite toy/bone for remaining calm. Provide a crate or secure a quiet area and take your dog there when the children are overwhelming or when her behavior is clearly evidencing that she’s out of control. Think of this area not as a punishment zone, but as a quiet room where she can go to unwind. When dogs get stirred up, it’s often due to being overstimulated or overtired. If you get frustrated with your child, you’ll look as though you’re frustrated with your dog, too. Sure, we know you’re yelling at your child, but your dog can’t decipher the focus of your feelings. Your reaction may lead her to feel more anxious or aggressive when your children are present, and may ultimately create a feeling of sibling rivalry between them. Try not to tense up when your dog and child/children are together. This reaction is understandable to us; however, your dog isn’t human. If the tension is notable only when the child and dog are together, then (in the dog’s mind) the child brings tension. Don’t lock up your dog when your children’s friends come to play. Your dog won’t understand why and will get hyper or assertive whenever their friends come to call. Think of other creative options, such as leashing your dog, using treat cups to encourage contained greeting, or enclosing her in an open playpen or crate until she is accustomed to the new visitor. Irresponsible breeders often push for the early adoption of puppies. While the cute factor of a 6-week-old puppy can’t be disputed, it should be criminal to take such a young pup away from her mom. Undeveloped and emotionally weak, such a puppy will likely be brought into a home where people (unless educated) will coddle them ad nauseum. Too often, the result of this heartfelt adoration is the development of a Super Alpha: a puppy who never learns respect for anyone. These puppies are often excessively nippy and may show aggression prematurely. If these behaviors aren’t arrested, the puppy may become a danger to live with and show behaviors that look as if he has a split personality: lovely when seeking a resource like food or attention, demonic when interrupted. If this description sounds familiar, please seek professional help. No one likes to feel discomfort. Most people will go to great measures to avoid pain or disappointment and, as parents we strive to protect our children from physical and emotional harm. Your dog’s instinct to protect himself from harm is no different. Still, it’s here that we must examine the differences in our species, since sometimes what we consider as emotional support is often misconstrued by your pup, and your efforts to “discipline” her may, in fact, not be communicating any useful information.. When your dog shows fear or discomfort, your immediate impulse may be to soothe her. It’s heartfelt, but detrimental, too. Remember, your dog doesn’t understand the reasoning behind human behavior and emotions: He merely reads your posture, eye contact, and tone of voice. When we comfort an animal, we lower both our body and our head, speak in a moderated tone, and look concerned; to a dog, these body cues bespeak utter panic. To a dog, we look cornered, trapped, and cowering — enforcing their fear rather than assuaging it. Teach your dog “Back,” directing him there whenever you anticipate a reaction or when his posture bespeaks caution. Leaders, lead. Use the direction “Under” (see Communicating with Your Dog) if you’re sitting, directing your dog under your legs instead of propping him on your lap or allowing him to dance about in front of you. Instruct your dog to “Follow” (see Happy Training, Happy Tails) whenever walking in unknown terrain or near a roadway. This message conveys guardianship and lets your dog depend on your protection. Use “Stay” to teach your dog to be still. This direction helps to contain his flight impulse and concentrates his attention on your pose. Stand confidently in the face of any distraction. If the object of your dog’s fear is stationary, let his leash go loose, approach it, and feign sniffing. As dogs see by sniffing, your reaction shows him how to overcome his fears while instilling confidence in your authority. No one wants to frighten their dog, but many people do just that, often under the guise of disciplining them. The truth of the matter is that puppy-rearing philosophies lag behind the newest theories on child-rearing, and we all would do well to take note. For example, physical abuse in response to parental frustration is illegal. Even the suspicion of emotional abuse will have school officials taking note. Hitting: When a hand is raised in frustration, a dog immediately seizes on the rapid motion and not on any other previous behavior. The predatory response part of her brain that activates upon seeing motion is an entity unto itself: Any prior impulses are abandoned. When the hand makes contact (and stings the skin), that feeling must also be interpreted. Because hitting has no real world template (after all, dog’s don’t hit each other), fear is often shown as an appeasement gesture. The true emotional damage comes into the relationship, however, when it is the very person who is attacking her that a dog needs to turn to when life doesn’t make sense . Sound like abuse? You’re right — it is — and completely ineffective. Yelling: Yelling is barking to a dog. Loud and interruptive, it will likely stop a dog in her tracks and may even cause an appeasement gesture, although neither is a sure sign of comprehension. Please reference Communicating with Your Dog for more insight. Chasing: Chasing a dog is insane and has no retentive value, save to guarantee a repeat performance. Put the shoe on your foot for a moment and imagine being chased by an enraged 400 pound gorilla who was also the very one you depended on for life’s sustenance. A dog has no other option but to process this reaction as a game or offer an appeasement gesture so extreme as to assure your pity. Nothing can be learned, and while this predatory attack is damaging emotionally, it commonly results in manic displacement activities. Dogs, like children and people, learn through cause and effect. If you want to get rid of a specific behavior, consider why your dog is doing it in the first place. Is he jumping up to get your attention or to get a resource or make himself comfortable? If these reactions are effective, he’ll do them again. If, however, when he jumps up, your hands consistently raise to cover your face and you ignore him, she won’t keep jumping up for attention. If, at the same time, you encourage her to sit or fetch a toy and give her attention for that, she’ll soon abandon jumping for sitting or play. If she jumps on the counter to steal food and nothing is there or she finds a distasteful snack (bread laced with wasabi sauce, for example), she’ll avoid this activity all together. With regards to jumping on the furnishings, your dog’s just as much of an opportunist as you are: Offer her a comfortable alternative, such as a floor pillow or dog bed, and when you can’t be there to control his choice, place something on the furnishings that make comfort impossible. A good correction should be seen as coming from the environment, not from you. At no point should your dog see the correction as coming from the person upon whom she relies most. Your attention is what most strongly motivates your dog’s behavior. Any good correction must end in prompting an appropriate displacement activity. Never just tell your dog what he has done wrong; show him what he should have done instead. “Get your ball,” “Give kisses,” “Outside.” Though the directions you give are individual to the infraction, each should allow you to reconnect with your dog and teach him what he should be doing instead.